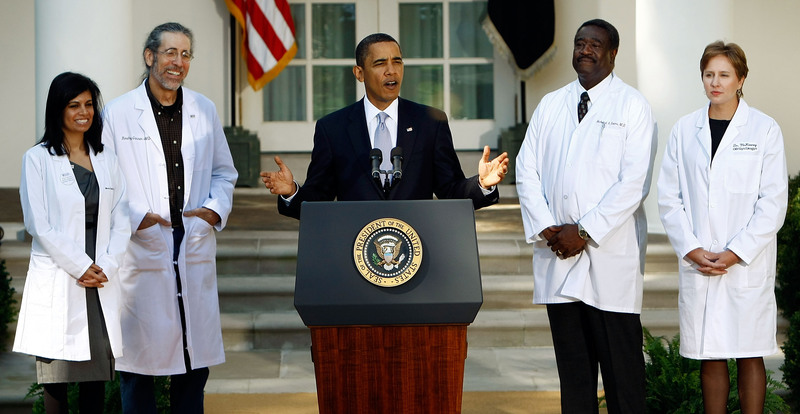 Good news for President Obama Friday: The White House's chief physician ruled President Obama in "excellent" health — with a few caveats which have snagged attention, like a small uptick in his cholesterol levels. It's not tough to guess why, seeing as there isn't very much to take issue with. But some people are never so happy as when taking issue with Obama, so his cholesterol's headlining role shouldn't come as too much surprise. Obama is six feet tall, and weighed in at 180 pounds — down about a pound-and-a-half since his previous examination. Improbably, given his advancing age at 53, his vision is still a perfect 20/20. His blood pressure was measured at 112/72, a figure firmly in the normal, healthy range, though ever-so-slightly up from his 107/70 result a couple years ago. A tobacco smoker for multiple decades, he still occasionally chews nicotine gum, but Jackson assures that Obama is still "nicotine free." His cholesterol rose from 193 to 213, a 20-point increase which set a few tongues wagging. A cholesterol score of 213 is considered "borderline high." He takes supplements for a Vitamin D deficiency, and suffers from a mild case of plantar fasciitis, a type of pain-inducing foot inflammation. It's not a unique or uncommon situation for a sitting President's health details to go out to the public. Former President George W. Bush's health condition was similarly broadcast and speculated about, in spite of the positive overall indicators — back in 2006, despite a fighting-fit evaluation (and a cholesterol score of 176, much better than the current President's) Bush laughed off the news that he'd gained weight by insisting he'd "ate too many birthday cakes." Of course, the Bush example reveals these numbers are no guarantee of picture-perfect health going forward. Physicians will often evaluate a patient's ten-year likelihood of a major heart incident, and by that standard Bush's 2006 checkup was well within range of his 2013 health scare over a blocked artery. On this front, New York-Presbyterian Hospital/Weill-Cornell Medical Center COO Cam Patterson had a particularly encouraging outlook for our current President. After reviewing Friday's report, he said that Obama has just a five percent likelihood of a heart issue from now until he's 63 — which is an extremely positive projection for his age. And seeing as he's only going to be President for about two-and-a-half more years, the nation can reasonably feel worry-free about any health crises at the top. So hats off, Mr. President — but keep hitting that gym.